About Silvia R. Message Silvia R.
Discover Siena with your Private Guide! Able to put across local information on the various sites in an interesting way and a pleasant manner . Silvia gave us an excellent introduction to Siena on a walking tour our first day here. She gave a great historical perspective, and managed to show us many sites in a thoughtful and organized fashion. Her fund of knowledge is excellent. We'd gladly refer any friends and family visiting the area to hire her as a guide! Silvia was an excellent tour guide. She was so knowledgeable and provided us with such a detailed tour of the area. She also took us to a family run winery for lunch which was a highlight for all of us. I would definitely recommend Silvia as a guide, and would book with her again in the future. If you want to understand Siena's history and enjoy yourself in the process, then Silvia is your guide! We were amazed at what we learned during our time together. Thank you Silvia for a wonderful tour! Very interesting and fun tour. 1. It would be good to tell the visitors by bus to get off at the first bus stop near the church. We didn't know to do that so just went to the main bus stop, then had to find the church, so that wasted about 20 minutes. 2. The tour was for 6 hours. We arrived a bit late because of the bus, which was our fault, but then really the tour ended after about 5 hours instead of 6. The guide was really interesting and lively but it wasn't the full 6 hours. Thank you. TOUR GUIDE RESPONSE: Thank you Janet. Beautiful and knowledable tour of the area surrounding San Gimignano. Excellent choices for cheese tasting on a working farm, and wine tasting with the Mozart wine maker! Silvia was a great guide. We learned a great deal from her and I would highly recommend you book a tour with her. I would do so again in a minute. Silvia is a superb tour guide. We wanted a guide with a thorough knowledge of the history, architecture, art and culture of Siena and she exceeded our expectations. In addition, she did it all with humour and enthusiasm. Thank you, Silvia! Incredible tour of Siena! Learned so much. Silvia was friendly, knowledgeable and went above and beyond to make sure we had an awesome time. Highly recommend! TOUR GUIDE RESPONSE: Thank you Albina! TOUR GUIDE RESPONSE: I also enjoed the time with you...a big hug to all of you! We had a brilliant and informative tour of Siena with slivia. She was very patient with our children and we stopped for delicious ice cream when they got hot and tired. We especially loved the owl contrade museum which really brought the paleo to life. Silvia was really friendly and a wonderful guide we would definitely recommend her. TOUR GUIDE RESPONSE: Thank you...hope to meet you again in the future. Ciao. Excellent tour lots of good information her love for Sierra was evident. TOUR GUIDE RESPONSE: thank you Jo. We spent the day with Silvia last week when we were in Tuscany. She picked us up at our villa and drove us to taste wine. It was a great day - two wineries - and lunch at the second one. Lunch was outside next to the vineyard. The food was amazing. Wish I could go back today. This is the second time that I used Silvia. I used her two years ago and she did an amazing job. I contacted her this time and she was available. She made a perfect day for us. Thanks Silvia - hope to see u soon!!!! Silvia was an awesome guide. From our first communication with her and during the confirmation through the incredible tour, Silvia explained everything we saw and took care of our family, instructing us where to go, and giving us great recommendations. I highly recommend her!!! We were very pleased with our tour of Tuscany provided by Silvia. She was such a pleasant guide and helped us enjoy our visit to Tuscany with her local knowledge and good humor. Silvia did an excellent job with our tour! She picked us up right on time in our hotel lobby with only a short walk to the van. We toured two wonderful towns, San Gimignano and Monteriggioni in the morning. Silvia did a wonderful job of explaining the history of the towns then letting us do some exploring on our own. Lunch was served at a wonderful winery in hills. The food and wine were excellent along with the charming couple who owned the winery. It was a long but enjoyable day. Thanks Silvia. Great tour. Great guide. Very flexable and much added knowledge. So much added value! From wine, to history, nature, and culture! Very impressive! Silvia was a wonderful guide for us and we toured with her for three days in Tuscany. She was flexible, personable and knowledgeable. We would highly recommend her to our friends. Silvia toured the two of us for three days in the Tuscany area. She was very professional with a magnetic personality. We visited local wineries and walked around villages with her and she always made us feel welcome. She was very flexible with our itinerary, making it easy to make changes as we went along. I would highly recommend Silvia to anyone wanting a special adventure in Tuscany. Silvia took the two of us on three days of tours in the Tuscany area. She has a deep knowledge of the area, taking us to many small towns and local wineries. She has a great personality and loves her job. She speaks fluent English and was able to answer all of our questions. I would highly recommend Silvia to anyone who wants a special time in the Tuscany area. Siena is like a living museum but there is much more to life there than the obvious sites. Sylvia did a marvelous job of bringing the city to life. She outlined the history of the major buildings and public spaces and also provided insight into the historical organization of life in the city. This included an explanation of the contradas (neighbourhood organizations) and how they interact, as well as an in-depth tour of the Owl Contrada museum, chapel, square and the rest of the area. Highly recommended. TOUR GUIDE RESPONSE: Thank you for your kind note. Hope to meet you again in the future. Ciao! A great customized tour. While walking along different contradas, we were able to grasp a quick, but deep glimpse about Siena's history and culture. And after her lively and enthusiastic description of Palio horse race (and it's historical importance for the contradas), we'll definitely visit Siena again during the weeks of the event. The enoteca Silvia chose for a brief wine tasting was excellent. We had a great time with Silvia. Silvia was knowledgable, had planned our tour for efficiency, and was a very good, safe driver. She took our personal limitations (4 elderly customers, of whom 2 were unstable walkers) into consideration. Friendly and upbeat. Took us to an alabaster carver's studio and an agriturismo farm specializing in saffron cultivation, where we had a very special lunch. Early Spring in the Tuscan hills was spectacular. Super day!!! A lovely tour - Silvia was brilliant - thank you. we had an excellent time touring sienna..... thanks Silvia! TOUR GUIDE RESPONSE: Dear Edmund, it has been a pleasure meeting you. Ciao Silvia. Our guide was interesting and informative and NOT boring. We felt she adjusted her information to our needs, covering history (some interesting anecdotes), Pallio, contrado and even pastries! Silvia is an absolute delight! She picked us up in her beautiful van for our 8 guests and drove us safely and with such interesting stories to San Gimignano for the long ride below Siena. She then toured us through the charming city with wonderful details and good information. Our time that she arranged at the saffron farm for lunch was a HIGHLIGHT of our trip. We had a wonderful time. Thank you, Silvia! We had a great time with Silvia who took us to a dairy farm for sheep cheese tasting, Pienza and Multacino along with two wineries. She was knowledgeable and gave us great insights into each town and place. We would not have learned so much if it wasn't for Silvia. We had an amazing day with her! While we got off to a late start, Silvia made up for it with her knowledge of Siena and San G. Once we got there, she dropped us off, parked the car, and led us in for our tour. She bought us local snacks and drinks and explained in detail about the town. I would highly recommend Silvia's tour! Silvia provided an excellent introduction to a very special city. Silvia took my wife and I around the hills of Tuscany for an 8 hour tour. She picked us up right on time and we visited Montepulciano, Pienza, Montalcino and had lunch at a beautiful winery. Along the way and at every stop she had great information about the locations, history, etc. Besides the details and the planned part of the tour; Silvia is a very nice lady who is extremely personable, we thoroughly enjoyed her company all day. Thanks Silvia, hope to see you again some day. Ciao! Silvia is a wonderful tour guide! We did Siena and San Gimignano with her. Her knowledge of dates and facts is outstanding and extremely interesting. She is welcoming, accommodating, patient and extremely helpful, overall a wonderful person to spend the day with. Silvia guided is through the center of Siena with knowledge and wit. She knew our interests and planned accordingly. Silvia made our wishes materialize. She planned visits to three small family wineries and at one we had a sumptuous lunch prepared by the owners. We were treated to a wonderful day seeing parts of Tuscany that the larger tours neglect. We always looked forward to dining at the places she recommended. It was another great day in the Tuscany region: Torri, San Galgano and another site as well. Ate at a well chosen farm restaurant. Silvia planned well. We toured several hill towns but the high point was lunch at a rural dairy farm--five or six courses of great good and wonderful wine. This was our first day with Silvia and she met all of our expectations and more. We wanted to concentrate on scenery, wine and food and we did. Silva led a fantastic tour for my husband and myself. Hike, winery, lunch and little towns of Chianti. We had a marvelous day. Silvia was delightful and very informative. Our party of 4 enjoyed our 8 hour day touring Siena and the surrounding area, including Monteriggioni. You don't want to miss seeing this most beautiful and historic part of Tuscany. We especially appreciated Silvia's kindness and patience in helping one slow poke in the group. Her modern, comfy van was a huge plus in transporting long tall Texans! Bravo Silvia! Sylvia was well versed on the history of the town. And considerate of our needs. She accommodated us with a slower pace as one of our group had a broken foot. My husband and I very much enjoyed our day with Silvia. She's very knowledgeable about the art, history, and culture of Siena. Besides her expertise, she has a lovely personality and a good sense of humor. Helpful in every way, from helping us find a laundry to making sure I had gluten-free food for our lunch together and for future meals, she was just great! Silvia was very knowledgeable and very kind. We learned a great deal and enjoyed her tour very much. Silvia gave a lively and well informed tour of Siena, and was flexible about our interests and questions. We recommend her highly. Silvia is an amazing tour guide, she is very professional, a delight to travel with and very knowledgeable of the area. After running into traffic that delayed us 45 minutes, Silvia greeted us with a smile on her face and ready to start our day. Despite the delay she did not rush our tour. We visited 2 wonderful wineries in the Chianti region along with stops in local villages and castles. Silvia stayed with us over the scheduled time without a single complaint, she made sure we were well taken care of! Wow Silvia is amazing. Her customer service was far beyond what she signed up for. We customized our tour to go to two winery's and than to go to the fort. When arriving at the first winery we discovered we left our passports and money in the hotel safe. She coordinated with the hotel and even went back in a storm to retrieve our items while we were at the second winery. She is amazing we highly recommend her for any tour you would like to go on. Silvia is an excellent guide! We spent a wonderful six hour day with her in Siena. We would highly recommend her! Silvia was so accommodating of our interests (a group of artists and art lovers) and never made us feel rushed. She was very professional and caring. Thanks Silvia!! Cheers, Maggie. Silvia did a fabulous job planning a 2 day tour around Tuscany countryside. Very unique tours! Her English is great and she is fun to spend the day with as well as very knowledgeable. GREAT GUIDE! Silvia was wonderful!!! She planned a very unique tour for us around the Tuscany countryside. We spent 2 days with her and got to go places the big groups don't go to. We had a private lunch at a olive oil and saffron farm along with some beautiful wineries. Her English was great, she was very knowledgeable and easy to spend the day with. I rate her a 10!! Silvia was great! Provided just the amount of suggestions while responding to what we want to do. The wine tasting and meal at a winery was fantastic. Thanks Silvia! Silvia was great. She was very good and her English was excellent! Very knowledgeable and patient! Would highly recommend! Silvia is the best guide! We booked five separate day tours with her, so we will be submitting this review for all five of them. We asked for specific things on our tours, mostly out of the way places that tourists typically don't see. She constantly amazed us at how well she had planned everything, how she anticipated our needs, and how perfectly she matched our requests with the places she planned for us to see. We were so sad to finally have to say goodbye to her! Silva was a joy for a tour guide and a perfect fit for our family. Friendly and engaging she really knows how to get it done. We had a great day with her and she planned a full, fun day in Tuscany. If you get a chance, make sure she books you a lunch a the vineyard she knows. Silvia made Siena come alive.We had 15 family members (kids and adults) on the tour, and she involved each of them with questions and specific facts. Her knowledge was exceptional and more importantly her delivery was great. Silvia was a wonderful tour guide. She was very knowledgeable and planned lots of things for us to see. We had a great meal at a winery. She had both days planned very well. It was a pleasure spending the two days with her. I would use Silvia again the next time I am in the Tuscany area. Silvia provided our family with a ton of information regarding the history of Siena, the interior of the cathedral, and then took us to the Piazza del Campo and knowledge of the horse races. She was excellent in her English and a very nice tour guide. Silvia was a fantastic guide. She was prompt to the meeting, knowledgeable, entertaining and helpful. We met her in Siena for a 2 hour tour of the highlights of the city. Not only did we see the sights, but she gave a great history lesson along the way. Her English is great which is important since our Italian is not... At the end of the tour, she helped us to find a nice place to dine in the San Gimignano countryside and even made the reservation for us. Thank you Silvia! Thank you Silvia - all of us enjoyed our visit to Tuscany. Our tours with you made for an enjoyable day- you were knowledgeable, well-spoken, fun to be with and very helpful - provided lots of information about Siena & San Gimignano. Definitely would recommend Silvia to other Tours by Locals clients. Thanks again Silvia - have added our comments to the San Gimignano tour. Sylvia was a superb tour guide! Her knowledge, personality and pace for our your were outstanding. I encourage anyone touring Siena to utilize her! Excellent guide; very knowledgeable and personable. Silvia is Tops!!! Requested a custom tour & she delivered in amazing style. She drove us south to Montalcino, with tour & tasting at Paradiso Winery, top Brunello & Mozart's vineyard. Then authentic lunch at Peccorino producing farm. Then to a picturesque Montepulciano nearby. Toured town, church, monuments & a Vin Nobile winery with deep caves dating to Etruscan times. Tasted & bought a case to be shipped home. Then drove back to Montereggioni enjoying picture perfect Tuscany, Highest Recommendations !!! Silvia knows Siena, & lives nearby in Montereggioni. She organized a delightful day in Siena. Walk the stone covered streets & appreciate that they were built on the topography of the hills, up & down. Toured Piazza del Campo, lunch at a Tuscan specialties restaurant, cathedral, monuments, Fortressa Medici, Cantrade museum/districts, post office for stamps & mailing post cards, some Fragola Gelato & shopping. Fully bilingual & always happy & smiling. Highest Recommendations for Silvia. She's Tops !!! Silvia knows Tuscany & loves her home - & it shows nicely. We wanted a countryside walk & Silvia delivered so fantastically. Met at Montereggioni & then drove to a countryside tavern & parked. Had a snack of fresh Peccorino & Proscuitto. Walked picturesque countryside roads & paths passing Tuscan houses, farms, fields & castello as we climbed the gentle slopes. Hiked the famous Via Franccegania pilgrim's trail through woods, streams before reaching Montereggioni - 10 km later. Highest Recommendation !!!!! Sylvia was awesome! We took a 3 tour of Sienna and she showed us all the sites and neighborhoods. She answered all our questions and customized the tour for us. We felt that this was the best tour we had in Italy. PERFECT!! MESMERIZING!! There's no words to properly describe the beauty and history learned on our tour with Silvia!! There couldn't be enough time to experiance everything we wanted to see and learn about this beautiful part of Tuscany! But, Silvia made sure we tried! Silvia truly is fantastic! What a caring informative and very kind young lady!! She made sure every question was anwnsered along with the historical facts with everything we saw! Silvia's talents and knowledge will forever be treasured! Brava Silvia!!!! She was terrific and gets an enthusiastic thumbs up. When we were in Siena in April for our tour, Silvia was ill. She arranged for a substitute guide named Elena, not sure of the spelling. Here is my review: 5 stars. A terrific guide. Knowledgeable and fun. 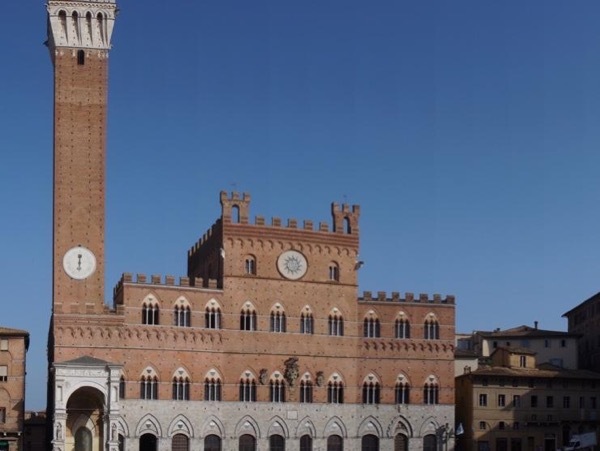 Took us through the historic heart of Siena and was able to focus the tour on areas that were of interest to us, which encompassed both the history and current life in the center of Siena. A very warm person with a good sense of humor. I highly recommend her. Interesting and informative tour. Silvia was friendly and showed us both historical Siena while also taking us to the best coffee and pastry shop in the town at our asking and recommended a great restaurant for lunch. TOUR GUIDE RESPONSE: Hi Mark and Patricia, thank you it was a pleasure meeting you. Ciao Silvia . Hello Couldn't miss the opportunity to say how much we enjoyed our day with Sylvia on 6/7/2013. I was hesitant as I knew of no one who had used ToursByLocals in the past, but what a wonderful experience. She met right on time, and was so friendly and accommodating we felt as thou we knew her forever. She was helpful in the restaurant and took us to two great wineries. Her vehicle was comfortable and she was a great driver on the winding roads in the hills of Tuscany. Would refer all to Sylvia! TOUR GUIDE RESPONSE: Hi Valerie, I am happy you had a nice time with me. Hope to have the opportunity of meeting you again in the future. Ciao Silvia.